William Golding’s Lord of the Flies was first published in 1954 and, at its simplest, it is the story of a group of young boys that are stranded on an island. This is not a simple story though; there is much more to it when you explore a little deeper. 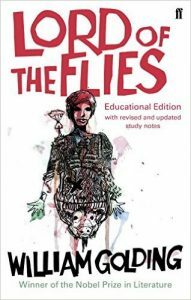 Lord of the Flies probes into the darker side of human nature and paints a rather unpleasant picture of a world where the rules are broken and discipline falls into the hands of those powerful enough to assert their authority over others. In Lord of the Flies even the sheep that follow blindly can be wolves. The first chapter introduces the characters of Ralph and Piggy. Neither boy was acquainted with the other before the accident that stranded them on the island. Ralph is the strong one. He is athletic, confident and intelligent. Piggy is a very different ball game. He wears glasses, he is overweight, he suffers from asthma and, if you can imagine the guy that everyone always picked on when you were at school; that would be Piggy. Beneath his ridicule provoking exterior though, Piggy is perhaps the most mature person on the island and has a very intelligent and organized mind. When the two boys find the large and colourful shell laying in the lagoon it is Piggy that recognizes it for what it is—a conch—and it is also Piggy who hits on the idea of using the conch like a trumpet, as a means of attracting any other survivors. Piggy can’t blow the conch himself because of his asthma. Instead he coaches Ralph, who quickly masters the technique, and soon other children are making their way to the beach. Once congregated, the group vote for a leader. They decide it should be Ralph. Decisions are made and rules set in place. Shelter is decided on as being important. The need to keep a signal fire burning is most important of all. The signal fire could be the boy’s only means of attracting the attention of a passing ship. If they want to be rescued, the fire must always be minded. All of these things are decided in the beginning. Friendships are formed and things are pretty good considering the circumstances. It doesn’t take long though before the rules are forgotten, and one boy, Jack, resents the fact that he was not made leader and conflict, in the end, is inevitable. I read the paper back version of Lord of the Flies and it was 233 pages long and while reading about the boy’s adventures on the island I found myself examining not only myself but society in general. Lord of the Flies is like that. It makes you think.